Ocean, Sky and Khaki: OSK Mission Accomplished! Keep up the good work! OSK Mission Accomplished! Keep up the good work! Australian soldiers serving in Afghanistan have been inundated with care packages from thoughtful people back home. Hundreds of packages were addressed to ‘an Australian soldier’ and included lollies, toiletries and cards. The smiles on the faces of the soldiers based at Camp Holland, clearly proved the care packages boosted morale. 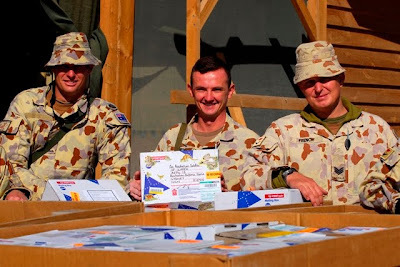 I really can't express how pleased I am to see that the efforts of people sending care packages to Aussie defence personnel deployed overseas have been reported by the DOD. This shows that the parcels addressed to "An Australian Soldier" are getting through. It is nice to think that our little blog has had an effect on the morale of our Defence members serving overseas, and that there are people out there who have visited our blog and decided to support our soldiers/sailors/airmen/K9s. Thank you is such a small thing to say, but please know that your support for our troops is truly appreciated, respected and goes a long way to show that people at home care about our Defence personnel. Here is the link to the item, there are more photographs. Note the number of packages packed in the large transport boxes. Well done parcel senders. And DOD - you've proven yourself susceptible to common sense after all. Wooo Hooo, a win for common sense. Good to see the troops with a little piece of home.